Y is for Yogurt Rice. Moving rapidly to the end of our series, we come to another letter that is quite challenging: the letter "Y". The most important (and, ahem, only) Y food I can think of is Yogurt (called Dahi in Marathi). India loves its dairy foods. From plain old milk and yogurt to rich ghee (clarified butter), dairy products find use in most Indian recipes. Yogurt is especially popular...the lower lactose content of yogurt makes it easier to digest than milk. Almost every household in India will have a little bowl devoted to making home-made yogurt, you just mix some warm milk with starter culture and set it overnight. Those little lactobacilli work their metabolic magic, and in several hours, you have thick, tangy yogurt all ready to be eaten. a) Drink: Mattha that I mentioned before, a cool-yet-flavorful drink that is the perfect aperitif. b) Main course: Dahi Bhaat (Yogurt Rice), which we shall make today. c) Snack: Dahi Vada, here is my recipe. A delicious chaat perfect for hot summer afternoons. d) Salad: Koshimbir which we made already for the "K" of Marathi food. Yogurt is the perfect no-fuss dressing for a simple salad. e) Dessert: Shrikhand, a delicious dessert consisting of flavored thickened yogurt. f) Candy: Shrikhand Goli...you can buy these tiny candies for a fraction of a rupee in corner stores, I loved them as a kid. Other states of India have many famous yogurt dishes in their repertoire: such as the sweet yogurt or mishti doi of West Bengal, the okra-in-yogurt-sauce or dahi bhindi of North India and the Gujarati kadhi or sweet yogurt-based curry. I am sure you could all add to this list! In the US, yogurt seems to be more of a sweet food. Flavored sweetened yogurts are very popular, as are yogurt smoothies, and in Indian restaurants, the ubiquitous mango lassi. In this context, an entree of rice mixed with spiced yogurt would seem downright bizarre. 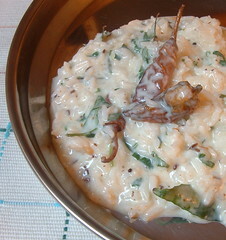 But yogurt-rice is very popular in all of Southern India, including Maharashtra. Plain steamed rice is cooled and then mixed with beaten yogurt tempered with some spices. It is a dish that is eaten cold, perfect during the dog days of summer. It is also a dish that is popular as a packed lunch for picnics and journeys, although I personally happen to think that prepared yogurt-rice tends to dry out and not taste as good as the freshly-made kind. As with any traditional dish, the recipe for yogurt-rice has dozens of variations and this is my own favorite recipe. One special "spice" that goes into my version of yogurt-rice is fried stuffed chillies. These can be made at home (under the blazing summer sun) or store-bought. A mixture of wonderful spices and yogurt (again!) is stuffed into chillies which have been marked with a slit or holes to allow the spice mixture to seep through. The chillies are dried to a crisp under the sun and stored away. These chillies can be fried at any time to serve as a little side-dish or can be used to flavor yogurt-rice. Here are some of these little beauties...the ones on the right I found in a local store, sold as "Swad Dahi Chillies" and the fat one on the left was bought in India. 1. Heat some oil and deep-fry the chillies (a few seconds in hot oil is enough to do this). Drain them and set aside. 2. Remove most of the oil from the pan, leaving only 2 tsp behind. Heat this oil and add all the tempering ingredients. Saute briefly till they are aromatic and set aside. 3. In a large bowl, whip together the milk and yogurt to form a smooth paste. Stir in the tempering and crushed fried chillies. 4. Stir in the rice gently. Garnish with cilantro and serve right away. 1. I like serving this rice with some Indian-style stir-fried vegetable for a complete meal. 2. If the yogurt you have on hand is too tangy, add a teaspoon of sugar to balance out the flavor. We shall meet in two days for the letter "Z". I have known for months what I will be making for this letter...would you like to hazard a guess? You've done a great job with this project. I've learned a lot. No clue what Z will be! what a wonderful series Nupur! great job! hmmm 'Z' for "zunka" ?? with Bhakri? yogurt rice... my absolute favorite food in the whole world! Not hard to please am I? I would savour it for breakfast lunch dinner, midnight snack or any other time! Arre ho! Yoghurt! Never thought of it although it's my absolute favourite. Duh! Btw, have you tried Yoghurt rice with Metkoot? Yum! 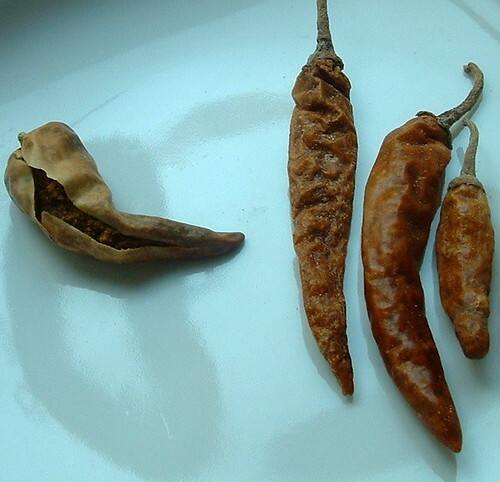 The 'Dahi chillies' here look like the Mor-molagha (buttermilk chillies in tamil) that shammi talked about in a post. Yogurt rice is my favorite and as a true tamilian, I have it at least every other day. Yours looks so creamy. Our version of buttermilk chilies do not have stuffing. Is the stuffing made of sesame seeds? Shrikhand goli- never seen that. Interesting candy! You must start a new series soon, Nupur. I am addicted to this series and the photos. I didn't realize you were doing A-Z. I guess I was reading in some other order. I will miss it too! Although I have been a reader for only about a week. by the way I made khichadi yesterday and had sol-kadhi with it. i like mugaachi khichadi and sol-kadhi. also regular kadhi.